Texas A&M University urges that one tomato plant be grown in a hanging container with a soil capacity of no less than 5 gallons--more than what the Topsy Turvy basket provides. The issue for success centers upon watering correctly so tomatoes do not dry out; watering twice a day may be needed in midsummer to prevent the tomato from dying or aborting flowers or fruits. More frequent fertilizing is necessary, too. 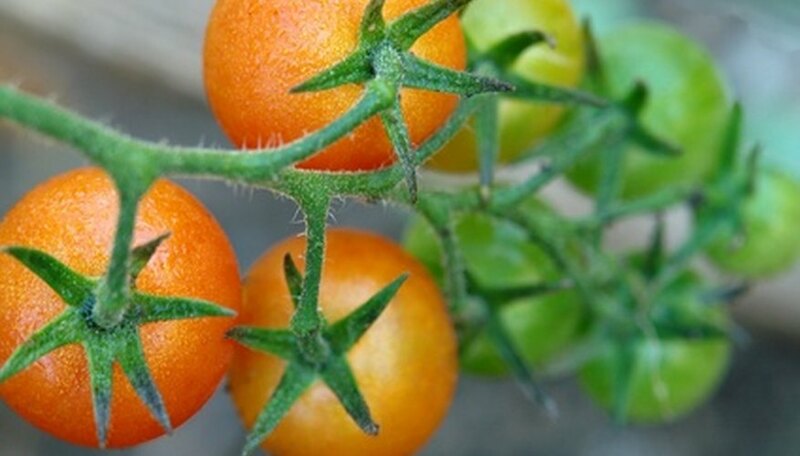 Tomatoes do not grow well in hot weather--they need warm, humid weather for best flowering and fruit maturation. The Topsy Turvy, as a hanging basket, warms its soil more quickly and it dries out more quickly--two issues that can lead to failure of the tomato plant. So choose tomatoes that are "early producing." Hopefully you can get ripe fruits before the most oppressive of heat bakes the Topsy Turvy plants by late July. The Early Girl variety ripens in 59 days, Bush Early Girl in 65 days and Fourth of July variety matures in 49 days. If you have a short, cooler summer, consider Northern Exposure, ripening in 67 days, or in hot-summer regions, Heatwave II at 68 days. Later-ripening types, including those tomatoes that grow into massive, heavy fruits, take upwards of 80 to 90 days to mature. Cherry tomatoes produce large numbers of smaller fruits about the size of ping-pong balls. Bushy types for the Topsy Turvy include Saladette, Patio and Patio Princess, while more vining types worth trying are Sun Gold, HoneyBunch and Sugar Snack. If you can only find nursery-grown plants that are standard tomato varieties, focus on those that are determinate or "bush types." These varieties grow to a definite stem length, listed as height on the plant label. Once their stems approach that mature length, they flower and fruit without adding more or viny, longer stems. Avoid determinate tomatoes that produce large fruits, as they will take longer to mature and put undue stress on the dangling stems from the Topsy Turvy. Try varieties Jetsonic, Roma, Sub Arctic and perhaps the best, Bush Celebrity.